It has been an interesting start to the NFL Combine for the Cleveland Browns, and that’s without even talking about the various players gathering at Lucas Oil Stadium for the weekend. Farmer opened up by apologizing for his role in the texting investigation currently enveloping the team. Farmer also made it clear, several times, that he acted alone when sending the texts in question. He’s not “taking the fall” for anyone and no one ordered him to send the texts. While that’s probably not good enough for some people who are so very sure that something must be up, Farmer’s admission today should put that conspiracy theory to bed. We’re still not sure why Farmer just didn’t walk down to the coaches booth, open the door and yell at former quarterbacks coach Dowell Loggains rather than text him, but the ram has touched the wall on that one. Until the NFL comes through with a conclusion to their investigation, it’s really time for everyone to move on. Brian Hoyer: Farmer said that if/when he meets with Hoyer it will be, like all his meetings, between the team and the player. For some reason that didn’t seem to sink in, as many media members repeatedly asked Farmer if he would meet with Hoyer or his agent this weekend at the combine. The biggest takeaway was Farmer comments about the ongoing state of the quarterback situation. A day after Pettine pointed out that since the Browns don’t know what is going to happen with Johnny Manziel they need to find a starting quarterback, Farmer echoed those comments and said that the team will look at all options – from free agency to the draft, including potentially trading up to get the quarterback they want. While we are still more than happy to entertain the idea of Farmer somehow working out a way for the Browns to draft Oregon quarterback Marcus Mariota, we have a feeling the Browns are going to go defense with both of their first-round picks. Everyone is on board as saying they want to build a team that plays defense and runs the ball, and there are certainly holes on the defensive side of the ball for a pair of first-round draft picks to help fill. 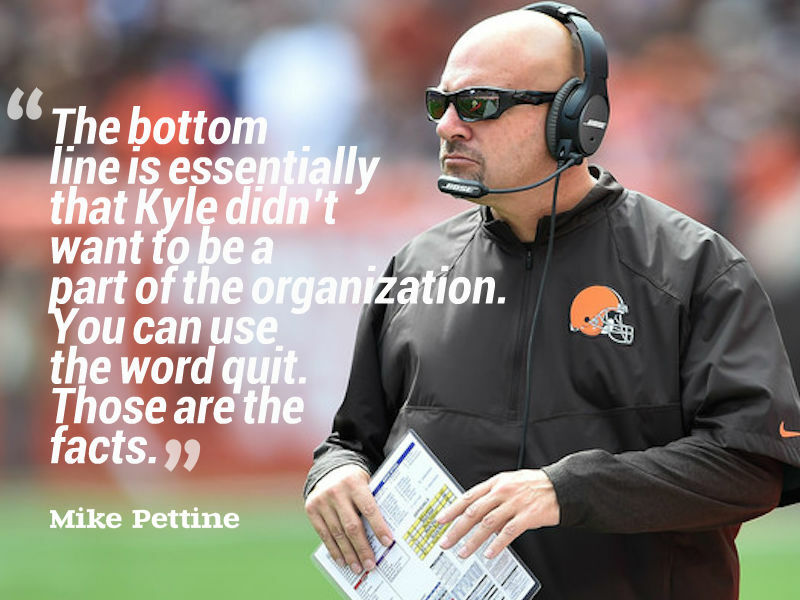 That will disappoint the crowd that is insistent that the Browns “must” draft a wide receiver in the first round, despite Farmer and Pettine making it abundantly clear they don’t think that is a sound strategy. But what are you going to do? One last note on Mariota: despite being listed on the official Oregon website as being 6-foot-4 and 219 pounds, many people expressed surprise when Mariota measured 6-foot-3-and-a-quarter and 222 pounds today at the combine. We really don’t know what people expected or why they are surprised. Finally, while it was a pleasant surprise to see a national writer actually write something nice about the Browns, we were still a little uneasy after reading this piece from Pete Prisco at CBS Sports about Manziel. Prisco wraps things up by declaring that Manziel will be the opening day starter come September. While Prisco makes the valid point that it would be ridiculous for the Browns to simply give up on a first-round draft pick after seeing him play just six quarters of football (no matter how historically horrific those quarters were), some of what he writes comes across as someone who wants to believe so much in Manziel that they overlook Manziel’s problems. And isn’t that the very reason the Browns are in their current situation with Manziel?